It says cryptocurrency mining will help it recuperate revenue. 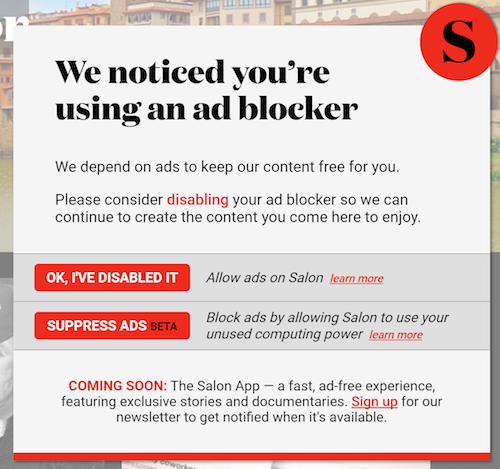 If you use an ad-blocker, you'll now be met with a pop-up when you visit Salon's website, the Financial Times reports. It will offer you two choices -- turn off your ad-blocker or let the website mine cryptocurrency with some of your computer's extra processing power. Salon says on its site that it makes its money off of advertisements, but because more and more readers are now using ad-blockers, it has seen a large drop in revenue. Cryptocurrency mining is its way of recuperating those losses. "Like most media sites, ad-blockers cut deeply into our revenue and create a more one-sided relationship between reader and publisher," Salon says. "For our beta program, we'll start by applying your processing power to mine cryptocurrencies to recoup lost ad revenue when you use an ad blocker. We plan to further use any learnings from this to help support the evolution and growth of blockchain technology, digital currencies and other ways to better service the value exchange between content and user contribution." If you choose to opt in, Salon says it will use a small portion of your computer's spare processing power to mine the cryptocurrency Monero and it notes that you won't have to install anything on your computer in order to let this happen. The site also says that it won't have access to anyone's personal files or information if they choose to opt in. Salon's mining efforts are powered by Coinhive, which created these sorts of scripts for exactly this reason. The Pirate Bay tried using it to generate ad-free revenue last year. However, while Salon is giving users an option to give up their computers to crypto mining, Coinhive's scripts have been previously slipped into other unsuspecting sites. Showtime, Politifact and a slew of government sites have all unknowingly hosted the cryptocurrency miner in the past. That a popular publication would choose to generate revenue through cryptocurrency mining seems pretty wild, but this could be a sign of things to come. Media outlets have consistently said they're losing money from ad-blockers, and if Salon's test is successful, more might follow its lead. If you agree to let Salon mine Monero with your computer, that setting will be good for up to 24 hours. After that, it will again prompt you to choose between your ad-blocker and the miner.